Time is fleeting. I can look back and get stuck in the past… or I can look back, reflect and learn. The negative voices of my ego can talk me out of virtually anything positive, if I listen. So I turn down the volume of those pessimistic voices and turn up the volume of inspiration, of optimism. There are people in this world that can be supportive, others not so much. I surround myself with enthusiastic, motivational people who share my values and beliefs. No matter how much we KNOW about anything, we can always learn more. The possibilities are endless. As a mom, I am blessed and honored to raise three beautiful souls. Many days are chaotic, some I lose my patience, Occasionally some are just hard. I am human. There are opportunities all around. I find myself second-guessing and over-analyzing at times. Why? I know I will never know unless I try. In times of trouble, despair or heartache…I can huddle in the darkness or I can see the light at the end of the tunnel. I can hide “Behind the Curtain” of my life or I can stand in the “spotlight” and DANCE through this life. 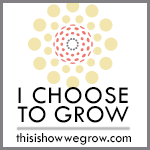 (Please join us on the “This is How We Grow Blog Hop -2013” by scrolling down to the badge at the bottom of site). Thank you! « When will MY phone ring? Will it? A lovely post. Things I try to tell myself every day. Sometimes I forget, seeing them here was a nice reminder. Thank you.